All transactions are safe and secure with a reliable history in online purchasing behind each of our associates. Buy the Jungle Out There Monk Theme Song t-shirt to own Monk clothing and merchandise. "It's a jungle out there, disorder and confusion everywhere, no one seems to care, well I do." So goes Randy Newman's 2004 Emmy award winning Monk theme song to the hit TV show. Hearing the lyrics is a sign that your favorite detective show is starting. Now it sounds familiar, right? 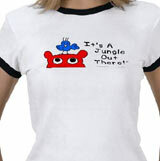 Take the "well I do" care to heart and express it with one of these "It's a jungle out there" Monk t-shirts. In addition to the Jungle Out There Monk Theme Song tee above, browse the Monk Clothing Gallery for more apparel like men's and women's clothes, kids shirts or hoodies.